Mission Statement Gardens for Humanity awakens and tends the gardens of the human spirit by teaching and celebrating our connection to nature, local agriculture, art and community while promoting an ecologically sustainable and more humane culture. Services and Projects To accomplish our mission we strive to assist home, school and community gardens and to organize events that promote gardening, ecological education, food security, and artistic expression. 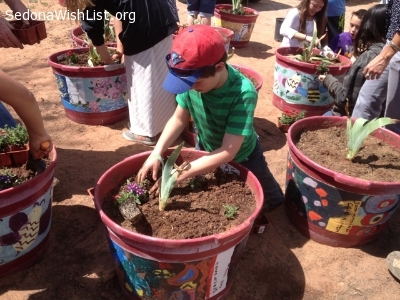 Gardens for Humanity is Helping Schools in our Region Develop Effective Learning Gardens. There are a variety of school gardens and we need a variety of materials. For container gardens: 10 -15 gallon nursery tubs or any appropriate large size pot or container. Even old galvanized water tanks can make durable planters. For raised planting beds: Lumber in good condition (can be used but not split or rotten) 2x6 lengths no shorter than 4 feet. Long pieces to 16 feet would be wonderful! 4x4 posts over 1 foot in length for corner braces. Lag bolts from 4 to 6 inches long. Many schools could use sturdy fencing material, weed barrier cloth, hardware cloth, and wood chips. Good planting soil with no chemicals is always welcome. The school garden movement has clearly engaged many schools. To maximize the impact, we will help schools plan and integrate their garden into the curriculum. The school's garden program can help promote good nutrition, an understanding of where our food comes from, hands-on experience with the environment, as well as cooperative learning in the arts and humanities. Attention bird lovers! 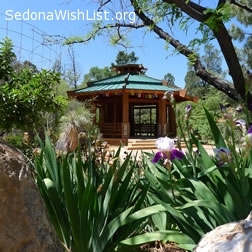 We need volunteers to visit the Peace Garden at the Sedona Creative Life Center to make sure that the bird feeders are well stocked. Mornings or evenings when the temperature is cooler and the birds are more active would be the best time to check up that our feathered friends have everything they need. 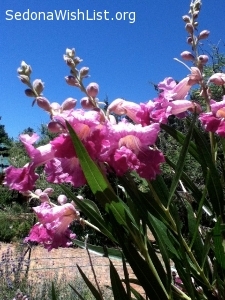 The Peace Garden is a paradise in the midst of Sedona with native plants, fruit trees, ornamental shrubs all thriving in a park-like setting. The Peace Pole and many of the trees from around the world are part of a meditative web of beauty and global peace. Volunteers can explore the garden when there and perhaps find a special place of beauty and contemplation. There are secluded shady places to sit and absorb the quite energy of nature when you come to visit. Can you make planter dollies for school container garden? 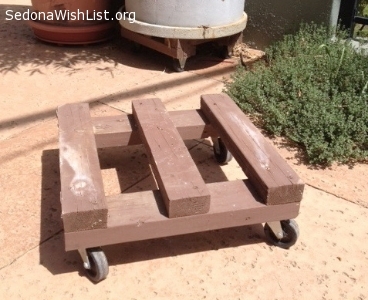 Is there a person you know with the tools and know-how who can fabricate some dollies for containers for a garden at Big Park Elementary School? The dollies are made with 5 pieces of 2 x 4 16" long. They are screwed together with deck screws and have a metal brace in the corners. They are finished off with rotating coaster wheels. See the accompanying photo. We could use about a dozen of them in total. 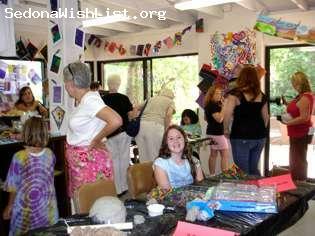 A great project for a men's group or service club. Students will use the dollies to hold their planting tubs of 10-15 gallon size which they will need to be able to move. Nursury tubs for school garden planters. We are looking for empty tubs that trees or shrubs come in to use for classroom container gardening. These would be the large, approximately 10-15 gallon size. These tubs will find new life being recycled as planters at Big Park Elementary School. They are perfect child-size containers that will be used to plant vegetables and learn about botany and the joy and science of growing your own food. 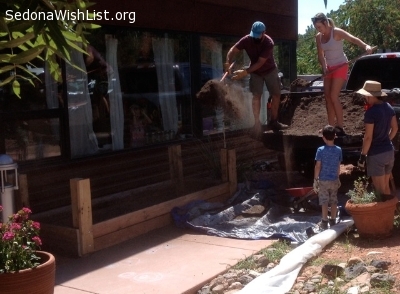 We also need donations of square-foot garden soil mix and some peat moss to fill the containers. With spring fast approaching, this would be a great addition to several classrooms in Sedona providing students with a quick and easy garden. The Peace Garden at the Creative Life Center is a beautiful nature sanctuary with a mix of native plants, shrubs, many species of trees, flowers, herbs and an orchard. There are quiet places to contemplate and enjoy its solemnity and the Pagoda. We need one or more people to visit the garden once a week to do some weeding or other small jobs. If interested, please contact Richard Sidy at the phone number listed for an orientation, and to set up a schedule.